Andhra pradesh postal department released the ap post office recruitment 2018 notification. the ap postal jobs 2018 notification is to fill up the 245 mail guard and postman posts. candidates who are looking for the postal recruitment 2018, can apply through indiapost.gov.in before the last date of 15th march 2018. Starting Date for Registration: 14-02-2018. Candidates need to have a valid email id & mobile number before applying. Next visit the official website i.e www.indiapost.gov.in/ appost.in. Select the post which you want to apply & Click Apply Online. Do the registration if your a new user. After that login with the details if already registered. Fill all the form carefully & submit form. The guidelines, which were formulated in 1990 and amended in 1997 and 2002, allow a person to transfer the confirmed ticket to another family member be it the father, mother, sibling, children or spouse. For transfer of ticket, an application must be submitted at least 24 hours in advance of the scheduled departure of the train. As per rules, tickets can also be transferred to another government servant travelling on duty. Train tickets can also be transferred to other members of the marriage party, if the head of such a party makes a request at least 24 hours in advance of the scheduled departure of the train. Save as otherwise, a berth or a seat reserved in the name of a person shall be used only by the person and shall not be transferable to any other person. Where the passenger makes a request in writing 24 hours before the scheduled departure of the train that the reservation made in his name may be transferred to another member of his family, meaning, Father, Mother, Brother, Sister, Son, Daughter, Husband and Wife. Where the passengers are students of a recognized educational institution and the Head of the institution makes a request in writing 48 hours before the scheduled departure of the train, that the reservation made in the name of any student be transferred to any other student of the same institute. Where the passengers are members of a marriage party and any person deemed to be Head of such party makes a request in writing 48 hours before the scheduled departure of the train that the reservation made in the name of any member of the marriage party be transferred to any other person. Where the passengers are a group of cadets of National Cadet Corps and any officer who is the head of the group, makes a request in writing at least 24 hours before the departure of the train that the reservation made in the name of any cadet be transferred to any other cadet. Such request will be granted only once. Regarding item no. (3), (4) and (5), such request for change in excess of 10% of the total strength of group shall not be granted. The request can only be made if you have a confirmed rail ticket. A written application must be submitted to the Station Manager or the Chief Reservation Supervisor, along with photo copies of the proof of his/her relationship with whom the ticket would be transferred. The application must be submitted well in advance, at least 24 hours before the scheduled departure of the train. In case of students, a written application is required from the head of a recognised institution, 48 hours before the scheduled departure of the train (to be transferred to any other student of the same institute). For larger group transfers, a request must be raised 48 hours before the scheduled departure of the train (not exceeding 10 percent of the total number of group members). Please note: Chief Reservation Supervisors of only important stations are authorized by the Railway Administration to permit the change of name of a passenger having a seat or berth reserved in his name. Travellers are advised to check with the concerned officer at the station, well in advance. Tamil Nadu Uniformed Services Recruitment Board (TNUSRB) has earlier conducted the TNUSRB Special Police Exam 2013 on 10th November 2013 at various TNUSRB specified centers in response to the TNUSRB Recruitment Notification 2013 for 10500 vacancies of Special Police positions. Number of eligible candidates who have applied for Special Police Positions in response to TNUSRB Recruitment 2013 have appeared in the TNUSRB Special Police Exam 2013. Tamil Nadu Uniformed service recruitment board (TNUSRB) conducted the examination for the recruitment of 10,500 different posts, Written Examination for Tamil Nadu Special Police Youth Brigade was held on 10th November 2013 (10/11/2013, Sunday) in various centers in various cities in Tamilnadu state. So many of the candidates are participate in the TN Police Special Police Youth Brigade written Exam. TNUSRB Answer Sheet is a best way to know which question you did right or wrong, so you can make an estimate about your result before it would be declared. Candidates are able to download it after it will be available and declared by official website. We will also give you updates when, cut of marks, counseling details will be announced. Visit our site daily basis to see future updates. TNUSRB was successfully over the written examination held on 10th November, 2013 at various centers across the Tamil Nadu. Large numbers of candidates was appeared the written examination and now all are waited for result. So, all candidates can check official website regularly because very soon result will be available. All candidates who faced the written examination those applicants should visit official website at www.tnusrb.tn.gov.in. On Official Home Page candidates can click the TN police youth brigade result 2013 will be provide. Download the PDF File and Open it. Press CTRL+F and Type your Registration number or other detail. If is found then they candidates will qualify. Delhi Technological University Admit Card 2013-14 Download at www.dce.edu for Assistant Professors Call letter. There will be many candidates who have applied for the examination to take place. Delhi Technological University has updated admit card notification for filling up the Assistant professors post on regular basis. The Delhi Technological University will conduct the examination on 19 Jan , 2014. Delhi technological university has conducting written examination those who are applied for this job notification. The candidates who have applied for DTU Assistant Professor examination will be able to download the admit cards. Delhi Technological University is going to recruit candidates for Assistant Professor posts. The admit cards will be displayed on DTU official site www.dce.edu in the last week of Dec , 2013. 1. Click the link given below or go to official site www.dce.edu. 2. Find the link for DTU Assistant Professors Admit Cards 2013 - 14. 3. Enter the details and click the button OK.
4. Next web page will be your admit cards. For appearing in written examination, Candidates have to download the Admit card from the University website www.dce.edu. No Separate Call letter/admit card for the post of Assistant professor will be sent to the candidates by post. NEW DELHI: In a relief to Rashtriya Janata Dal (RJD) leader Lalu Prasad, the Supreme Court on Friday granted him bail in a fodder scam case. Lalu Prasad was awarded five years' imprisonment by the special Ranchi court for his alleged involvement in the fodder scam. There were 44 accused in the case and 37 of them have already been granted bail and bail application of six others is under consideration of the trial court. The apex court has granted bail on the grounds of parity with others convicted in the case, CNN-IBN reported. A bench headed by Chief Justice P Sathasivam granted bail after noting that several other similarly placed convicts have already been granted bail in the case. The bench also comprising Justice Ranjan Gogoi, however, left it to the trial court to decide the bail bonds, sureties and other conditions to be imposed on the former Member of Parliament. The RJD chief has challenged the Jharkhand High Court's 31 October interim order rejecting his plea for bail during the dependency of his appeal against the trial court order sentencing him to undergo an imprisonment of five years and a two fines totalling to Rs. 25 lakhs. 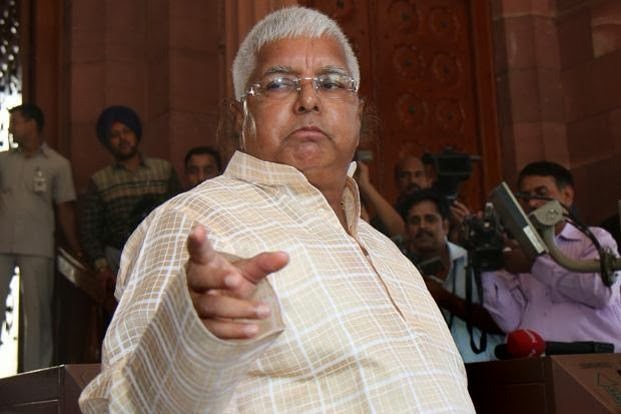 Faulting the high court order, Lalu Prasad's petition said that RK Rana who too was convicted for the same offence as he was and awarded five years rigorous imprisonment was granted bail six days before his bail plea was rejected. The Central Bureau of Investigation, which is the prosecuting agency in the case, did not oppose Lalu Prasad's bail plea. Pleading for bail, Lalu Prasad, who lost his membership of Parliament after being convicted in the case, submitted that of the 44 persons convicted along with him, 37 have been granted bail and no one's, except his bail plea has been rejected. Senior advocate Ram Jethmalani, appearing for the politician, submitted Prasad has already spent 12 months behind bars, including two months of his five-year sentence, and sought bail, saying the Jharkhand High Court before which his appeal is pending will take at least seven to eight years to decide the case. The RJD chief, another former Bihar chief minister Jagannath Mishra and 43 others were on 30th September convicted by a special CBI court in the fodder scam case involving fraudulent withdrawal of Rs.37.7 crore from Chaibasa treasury during the Lalu-led RJD regime. The CBI court had pronounced varying prison terms for the convicted persons on 3rd October. A Swedish company has launched what it claims is Europe's first Bitcoin ATM. The machine allows people to exchange cash in their country's currency to Bitcoins on their mobile wallet. Instagram is adding private messaging. The Facebook-owned photo-sharing social network announced the new service called Instagram Direct at a press event in Manhattan. "Sometimes you want to be able to share not with everyone but just with a specific group," says Instagram co-founder Kevin Systrom. "Honestly, our guidance is to not accept (pictures) from people that you don't know," Systrom says. As for the people who are on your list, you'll know that they've seen what you've sent when their own profile picture materializes with a checkmark. When they like the picture, the checkmark turns to a heart. Send Photo And Video Messages To Friends! Instagram has announced the Instagram Direct messaging feature that would allow users to send text, video, and photo messages privately. unlike its focus solely on photos and videos earlier. How To Use Instagram Direct Messaging Feature? After editing a photo on your Instagram, you can share it with a maximum of 15 people. The avatar of the recipient of the photo (if online) would light up in real time, showing the sender that he has liked/seen the message. On the top right corner of your Instagram home screen, you will now see a fresh Inbox tab, using which you can check your recent messages. Photos and videos can be received only from people that you follow. Instagram Direct will allow you to send an Instagram image or video to up to 15 people directly, after which point you'll be able to reply with just text, as a chat thread. And, to stop your inbox being flooded with spam, you can only receive direct messages from people you already follow. where you'll be able to allow or disallow them. Apple iPad 5 and iPad mini 2 launched on Tuesday, October 22, in San Francisco. This event is happning in San Francisco. Time to be revealed at 10am pacific time (PCT), which means 6pm over here. What's new for the iPads? The iPad 5 is widely expected to sport a thinner and lighter design with an improved resolution camera. It will use the same A7 chip that is utilized in the iPhone 5S. The updated iPad mini 2 should see a retina display and will receive a spec upgrade also using the A7 chip. Apple is slated to unveil its next-generation iPad 5 and iPad Mini 2 and the all new Macbook Pro line, along with the refreshed Mac operating system – the Mavericks OS X - at the Yerba Buena Center for the Arts in San Francisco, California. 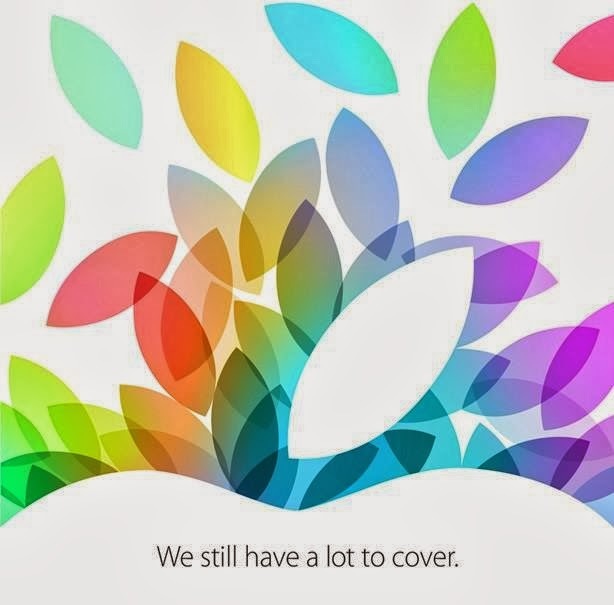 The Cupertino company's press invitation for the keynote address states, "We still have a lot to cover." However, despite the cryptic tag-line, the contents of today's event probably won't be all that surprising. With the launch being referred to by most of the tech media as “the Apple iPad event” it's a fairly safe bet to say that we can expect two new iPads: an iPad 5 and a second generation iPad mini 2. Candidates age should be 55 years. Relaxation is available. Candidates must possess Graduate for S.No.5, 7,9,10 & 12 Posts, SSC with ITI for S.No.11 Post, Master’s Degree in concerned subject for remaining Posts and relevant experience. Candidates will be selected based on their performance in the interview. Candidates have to pay the processing fee of Rs. 500/- (Rs.100/- in case of SC/ ST candidate) for S.No.1 to 5 Posts, Rs. 250/- (Rs.50/- in case of SC/ ST candidate) for S.No.6 to 10 Posts in cash or demand draft respectively in favour of “Director, EMRC, Ahmedabad”. Interested Candidates send their application in prescribed format, fee receipt to I/c Director, Educational Multimedia Research Centre, Gujarat University, Navrangpura, Ahmedabad 380 009 within 21 days from the date of publication of this advertisement. Gujarat Informatics Ltd. (GIL) is the nodal agency of Government of Gujarat catering as consulting services to various departments and also nodal agency for procurement of IT related hardware services. Gujarat Informatics Ltd. (GIL) Invites Applications for the posts of Project Managers. B.E / B.Tech / MSC (IT) from recognized university. MBA from reputed institutions is preferred. Project Management, Management Proficiency Supervision, Process Improvement, Tracking Budget Expenses, Self-Development, Planning, Performance Management, Inventory Control, Verbal Communication, Risk Management and State of Art Reporting skills. Upto Rs.30,000/- CTC and higher salary may be considered in deserving cases. 06.10.2013 is the last date before which the applications are to be received at the office. Marks in the qualifying exam and performance in the interview will be considered basis for the selection.